Diagnosing Lyme disease can be difficult due to the wide range of symptoms and lack of a reliable blood test. GPs often miss a Lyme disease diagnosis and there are also many uncertainties surrounding the disease, as outlined by the James Lind Alliance findings and Independent Reviews commissioned by the Department of Health. An infected tick bite can result in a rash known as erythema migrans (EM). 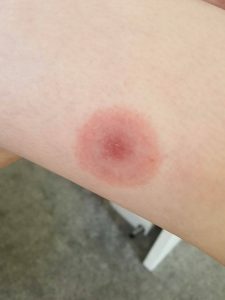 This can be distinctive and resemble a bull’s-eye target, however it can also be atypical and some people discover multiple rashes. This EM rash is diagnostic of Lyme disease and treatment should start right away without the need for a blood test. The rash can often be mistaken for ringworm, cellulitis or an allergic reaction. Public Health England estimate that one third of people infected may not experience an EM rash although a study done in an Infectious Disease clinic in Glasgow discovered that only 4% of their suspected Lyme disease patients had an EM rash. Even when the rash occurs, it may be faint or on an area of the body which isn’t very visible like the scalp, behind the ears, behind the knees or on the back. Click here for examples of the EM rash. Blood tests can be used to confirm a suspected case of Lyme disease but they are not 100% reliable and a negative result cannot be used to rule out Lyme disease. The initial test offered by the NHS is called an ELISA test which is usually performed at your local hospital laboratory and takes a few days or possibly a week to come back. If the ELISA test is positive or equivocal, the blood sample is usually sent to the Rare and Imported Pathogens Laboratory at Porton Down in England or the NHS Highland National Lyme Borreliosis Testing Laboratory at Raigmore Hospital in Scotland. The Western blot (sometimes called an Immunoblot) is then performed. Standard testing procedures performed in the USA appear to have a sensitivity of around 50% which means that approximately half the tests carried out could result in false negatives. Although there have been no specific studies to find out the percentage of false negatives in the UK, the reliability of the two-tier testing system used here is also questionable. The NHS sometimes use a Cerebrospinal fluid (CSF) test for antibodies and is obtained by a lumbar puncture. An EIA is used to confirm the presence of antibodies to Borrelia. This can give a positive result before the blood serology becomes positive, but has a high rate of false negatives in Lyme disease patients. Some patients prefer to use private specialist laboratories abroad which are favoured by private Lyme treating specialists. According to the American CDC and Public Health England, Lyme disease can be diagnosed clinically without a positive blood test result or evidence of the erythema migrans rash based on symptoms and a history of possible exposure. You can read about patient experiences with NHS care here, based on surveys conducted by Caudwell LymeCo charity.